Class of 2022... Start here! Enroll in one English or math course at a regionally accredited college in the summer term immediately following graduation from high school. ESP participants enrolled in the summer term will have continuing enrollment for fall. Freshmen participating in the ESP program from the Albuquerque area (including Bernalillo and Rio Rancho) may enroll at a UNM campus or Central New Mexico Community College (CNM). Freshmen from outside the Albuquerque area may complete ESP requirements by enrolling in one English or math course at a regionally accredited college, including online courses. 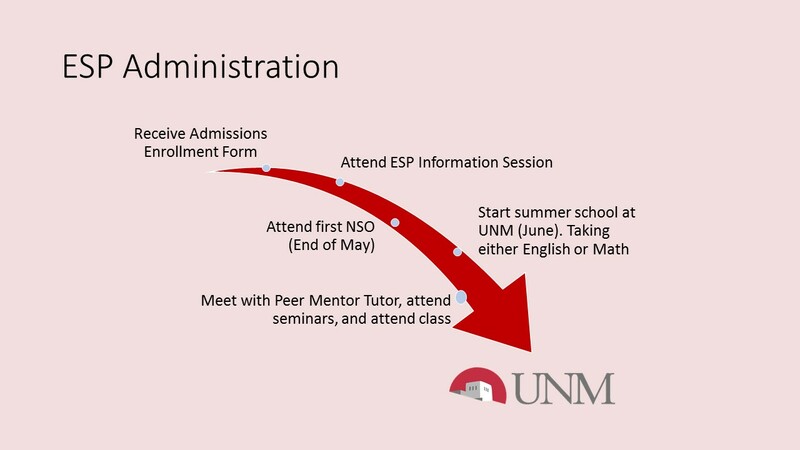 Evidence of enrollment in one course (a copy of the student's course schedule as an example), followed by an official college transcript when courses are complete, must be provided to the UNM Admissions Office in order to enroll in fall courses. Spring 2019 Information Sessions take place on Monday, April 22 and Monday, April 29 in the Student Union Building (Luminaria room) from 6 to 7pm. Campus housing is available during the summer. Contact UNM Residence Life & Student Housing for more information about summer housing options. Student Info Have a question? This is the place to start. Student Employment Find work on UNM's campus, including work study. ESP participants who select to take their courses at UNM Albuquerque campus are encouraged to submit the 2018/2019 Free Application for Federal Student Aid (FAFSA) in order to be considered for summer 2019 financial assistance. The 2019/2020 FAFSA is available October 1, 2018. You will be registered for NSO once you have confirmed your place as an ESP participant. For students starting classes on June 4, the recommended NSO will take place May 29-May 30. If you need any special accommodations please contact Tina Zuniga. I want to participate in ESP, what do I need to do? Please submit the ESP Acceptance Form that you received to the Office of Admissions. When does the Early Start Program begin? ESP at UNM for the Summer 2019 session begins on June 4, 2018. If you're attending CNM or another institution you will need to enroll in the summer term. When will I attend New Student Orientation? The ESP Program will reserve your spot! You will receive more information regarding sessions and date at the Information Session. For questions regarding courses, contact Corine Gonzalez at corineg@unm.edu. Students identified as ESP participants who experience extenuating circumstances or substantially improve their score may petition for fall enrollment by submitting a written request to the Admissions Office explaining their circumstances. Requests may be emailed to Deborah Kieltyka at deborahk@unm.edu.